There is a winter storm watch for metro Detroit starting midnight Monday night through Wednesday morning. 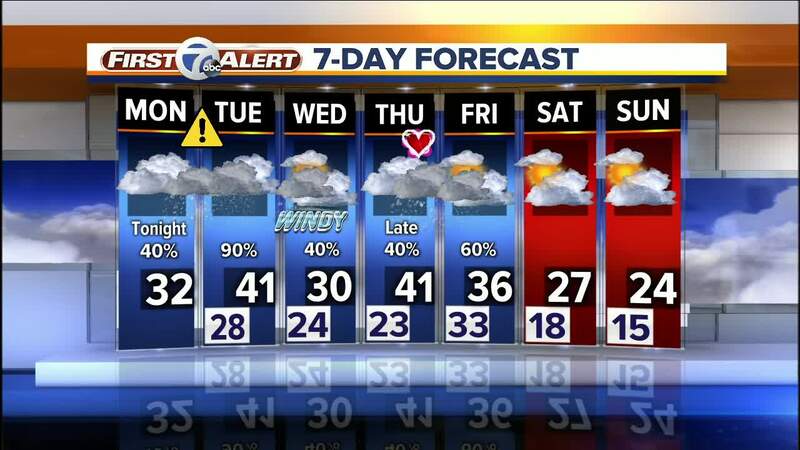 (WXYZ) — There is a winter storm watch for metro Detroit starting midnight Monday night through Wednesday morning. Tuesday morning will be the worst, with icy roads from a mixture of snow, sleet, and freezing rain in the metro Detroit area and mostly snow around and north of I-69. The Tuesday evening drive will not be great, but it will be better than Tuesday morning and Wednesday morning in the metro area. Wednesday morning's drive will be changing back from rain to freezing rain and snow, but less of a problem than Tuesday morning. Areas south of I-94 should expect more ice Monday night into Tuesday morning than snow. Around an inch or two of snow will fall at the most, along with ice accumulation that may close schools. There is a chance of freezing rain alone for a while on Tuesday morning and then rain Tuesday afternoon. Then, from rain to sleet and snow Tuesday night into Wednesday morning. Northern suburbs around and south of M-59 will get an even mixture of ice and snow Monday night into Tuesday morning.